It's getting colder, which means it's boot season! I love boot cuffs because they're adorable, and they keep my legs nice and toasty. This pattern is very versatile and you can experiment with different color(s) combinations to match with different outfits. Worsted weight yarn in any colors you like. I used Craft Smart Gray and White. For the color change, I dropped the color I wasn't using and picked it up at the next row. When you you sl st to join at the end of the row, insert the hook in the top of the ch and yarn over and pull through with the new color. Drop the first one and continue the next row with the new color. When you finish that row, you can pick up the first color where you left it. Fold the piece in half and sl st the end with the beginning to make a circle. Fold the piece inside out so the seam is on the inside. Turn on its side; you will now be working in rounds. Do not fasten off. Ch 1. Sc evenly around. Switch to white and sl st with beginning to join. Ch 3. 1 dc in same space as join. *Ch 1. Skip 1 sc. 2 dc in next sc. * Repeat from * to * around. Switch to gray and sl st in top of ch 3 to join. Ch 3. 1 dc in same space as join. *Ch 1. 2 dc in ch 1 space. * Repeat from * to * around and join with sl st in top of ch 3. Repeat Row 2 and alternate colors every row. In white, ch 1 and sc in each dc and ch 1 space. Sl st with beginning ch 1 to join. In gray, ch 8. Sc in each ch across. Fasten off leaving a long tail to attach to the bow and to the boot cuff. 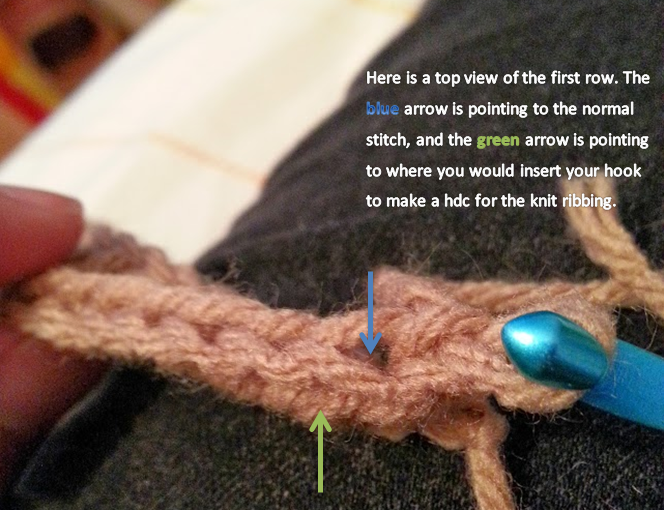 Scrunch up the white piece and use the tapestry needle to sew the gray piece around the center. With the tapestry needle still attached to the yarn, sew on the completed bow at the top of the boot cuff. I put my bow where the seam was. Weave in any remaining ends. Please let me know if you have any questions about the pattern in the comments below! Hey Justine! I absolutely LOVE this pattern! I LOVE all your patterns lol! 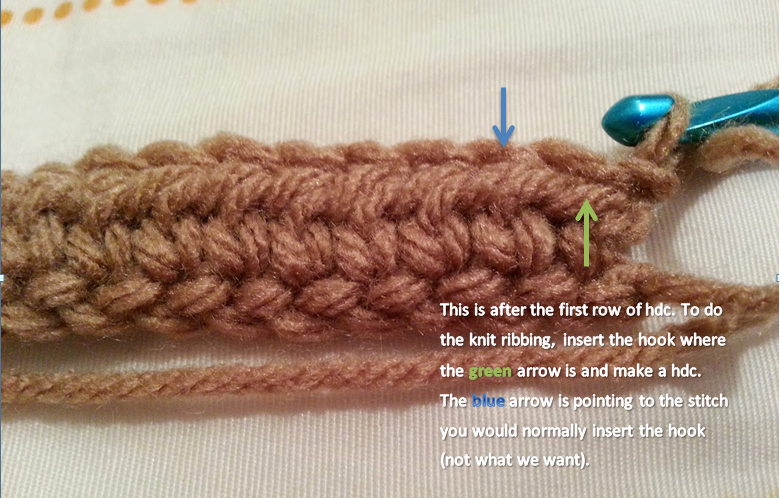 :) I recently started crocheting a couple of months ago, a friend taught me and I absolutely love it!! I am addicted! ;) lol but for some reason for this pattern and your other one, the boot cuffs my boot cuffs come out to be a LOT bigger than yours. I don't understand what I am doing wrong:( can you help me?? Thanks so much!! Thank you for the comment! 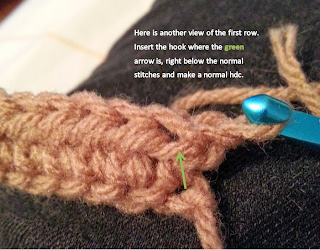 I'm glad that you are enjoying crochet and can learn something from my blog :) About your boot cuffs coming out too big, the only thing I can think of is maybe you are using a different weight yarn than I am or a different sized hook. 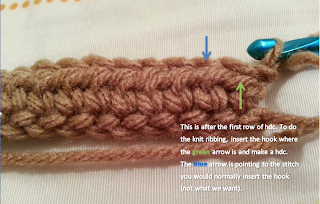 You can adjust the number of rows you are making for the top portion of the cuff. Whatever size hook or weight yarn you use, make an amount of rows that will fit around your calf (doesn't necessarily have to be how many I made). Hope this helps, and I can't wait to see your finished projects! you're so welcome :) yes ma'am that definitely did help! Thanks so much! how can I send the pictures of my finished project to you? I also have one more question.. there have been a couple of people wanting to order a pair for their little girl. do you know how I could do that?? my guess is maybe not do as many rows and a smaller needle, what do you think? You can upload them on my Facebook page or on Ravelry (links above). To make them smaller, yes, you can use a smaller gauge hook and make a lot fewer rows for the top portion. Happy crocheting! Hey Justine. I am in dying need of a pattern for a newborn baby deer hat and diaper cover set. I have been looking everywhere and I can't find the pattern! :( do you know where I could find it? Thanks so much!